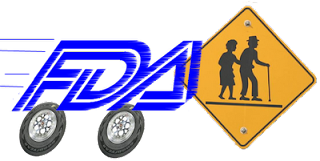 Pharma Marketing Blog: FDA Caught Speeding. Puts Public Safety at Risk. FDA Caught Speeding. Puts Public Safety at Risk. "An FDA effort to speed approval of new medicines allowed drugs for stroke prevention, cancer and multiple sclerosis onto the market without proper safety analysis, according to two drug-safety experts," reports the Wall Street Journal in a review (here) of a "viewpoint" recently published in JAMA. "Here’s the truth -- there is no such thing as a 'safe' drug. It's the patient who must understand the risks required to achieve the benefit. That’s why the patient voice must be heard during all phases of the regulatory review process." Unfortunately, I don't think Pitts actually read the piece in JAMA. The drug safety expert authors of that piece (Thomas J. Moore and Curt D. Furberg) did not claim that drugs approved by the FDA should be "safe." They made the argument that accelerated approval by FDA of several powerful drugs with UNKNOWN safety issues were no better at improving outcomes than drugs currently on the market whose safety issues are well-known. "Although enabling new drugs with a favorable benefit-to-harm balance to become available to patients more rapidly is a laudable goal," said Moore and Furberg, "the underlying question is what public health risks are taken when drugs are approved for widespread use while important safety questions remain unanswered." The authors cite several specific drugs that were fast-tracked for approval without adequate safety information available. I'd like to focus on one: Dabigatran for prevention of stroke. Dabigatran is marketed as Pradaxa by Boehringer Ingelheim (BI). According to Moore and Furberg, Pradaxa benefited from "3 different FDA policies promoting innovation. This drug received both Fast Track and Priority Reviews and was studied in a single large phase 3 trial rather than in at least 2 pivotal trials, as normally required...Within less than a year of approval, 1 survey showed that dabigatran accounted for more serious adverse drug events reported to the FDA during the second quarter of 2011 than any other regularly monitored drug. Risk of hemorrhage was prominent in older patients (median age, 80 years), a subgroup for whom declining kidney function or other factors may have increased bleeding risk. Both a manufacturer package insert revision and the European Medicines Agency have called for closer monitoring of kidney function, a needed step because even moderate kidney impairment increases dabigatran levels more than 2-fold. In addition, unlike warfarin, no antidote is available for use in bleeding emergencies related to dabigatran. Evidence was beginning to emerge that dabigatran-related bleeding— whether from trauma or as an adverse effect—may be more difficult to treat than warfarin-related bleeding." Couple this safety issue with the promotion of Pradaxa in the media as a "super pill" and a "revolutionary drug" (see "Bad Journalism or Bad Pharma?") and you end up with a real public safety issue that patients should be concerned about. BI itself stoked this Pradaxa-mania (read, for example, "BI Masters the Art of WOM through Its 'Parrots,' er, Spokespersons" and "Full BOEHR(inger) Social Media Reporting of RELY Trial Results"). Sadly, Woodcock may have heard from "patient advocates" paid by pharma companies to testify before the FDA, but who advocates for the patients harmed by drugs like Pradaxa? Their stories are locked in the FDA's adverse event database, which is not generally cited during drug approval Hearings at the FDA. FYI, I did read the article.